It’s 1910, and orphan Maia is off on the greatest adventure of her life! She is leaving her English boarding school and sailing up the faraway Amazon river, to start a new life with distant relatives there. Nothing can prepare Maia for the fabulous wilderness of the Amazon, or its border-town Manaus, surrounded by moist jungle greenery. But Maia’s relatives are not all they seem, and soon she and a mysterious Indian boy, Finn, are escaping up the Amazon on a journey of discovery and danger. 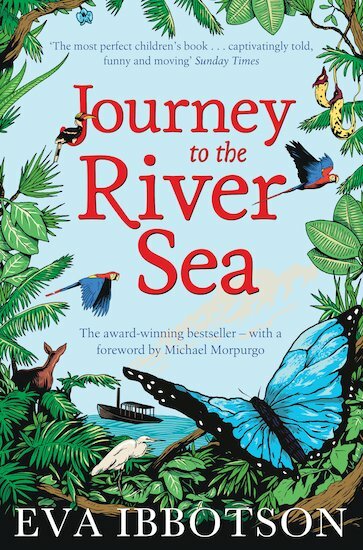 Can they survive in the uncharted world of the river sea – a place of anacondas and insects, crocodiles and monkeys, poisonous trees and strange, impossible beasts? Eva Ibbotson’s Smarties Gold Award winner is a voyage into the exotic landscape that lies buried within every child’s imagination. 30 copies of this classic children’s book to accompany Read and Respond: Journey to the River Sea.